Smack - ZineWiki - the history and culture of zines, independent media and the small press. 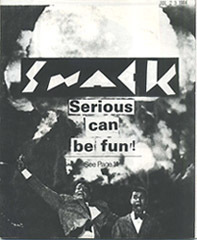 Smack was a literary zine published in the 1980s in Seattle, Washington, U.S.A..
Smack was a newsletter size zine, 7" by 8 ½". It included art work, fiction, interviews, and reviews. Also included were reviews of several Robert Mitchum films, and zine reviews of Black on White, OP, Hamsterama, Rumble, The Fringe, and No Cause For Concern?. This page was last modified on 19 November 2012, at 06:28.